Humans have been making murals — painting a bit of art directly on a wall — for millennia, the world over. Different walls, at different times and in different places, have all reflected different mural cultures. 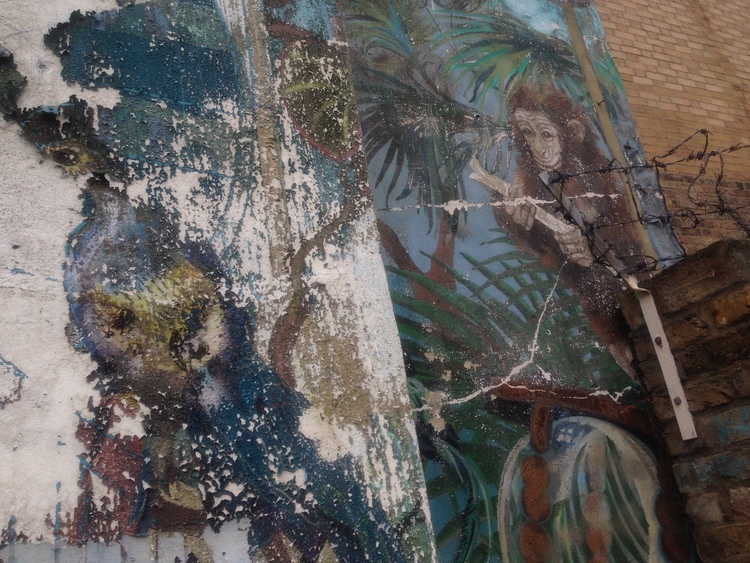 I’m a fan of the crumbling remains of the municipal murals of 1980s London, and here’s a brief trip through some of them. 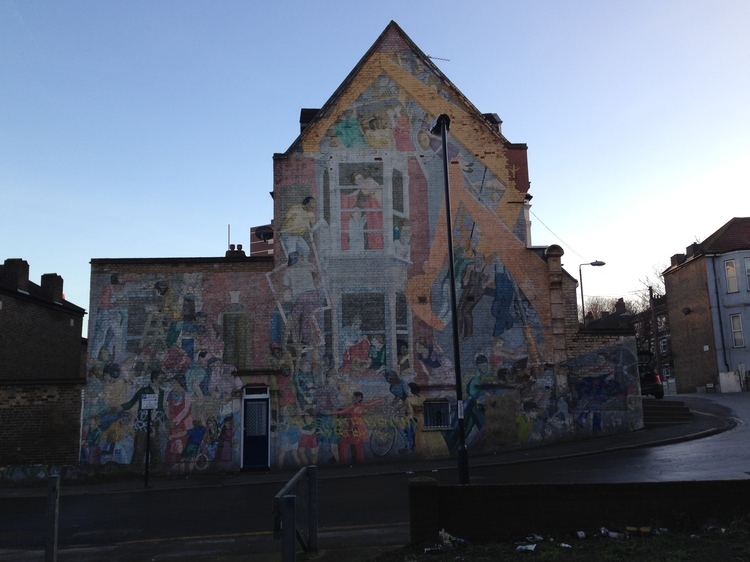 The London Mural Preservation Society have a great map of these, with detailed notes. It’s not exhaustive — they don’t, for example, cover the many murals in primary school playgrounds — but it does offer background information for over sixty of them. Surveying them as a whole, some key themes emerge. First up, nature. The French town of Grenoble recently announced it would get rid of advertising billboards and plant trees instead. 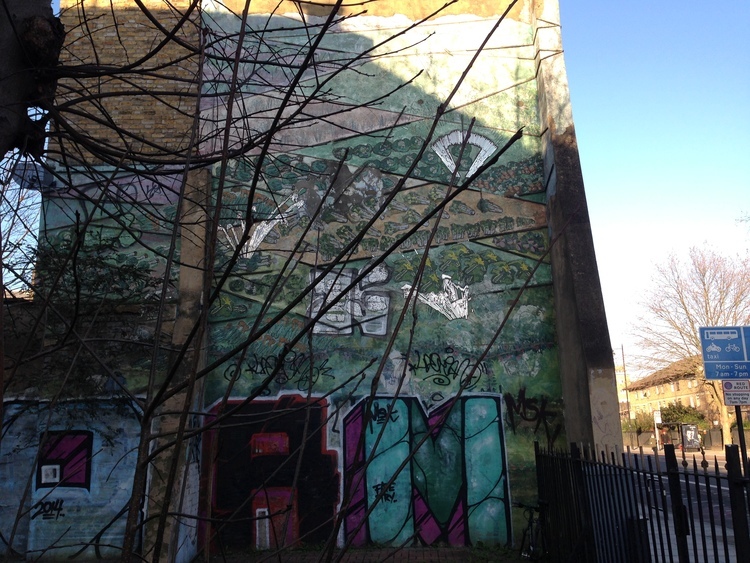 It seems that when 1980s Londoners were offered the side of a wall for community art, rather than to sell as advertising space, they looked towards something green. And it wasn’t necessarily an escape to the countryside, but to draw out the nature around them too. 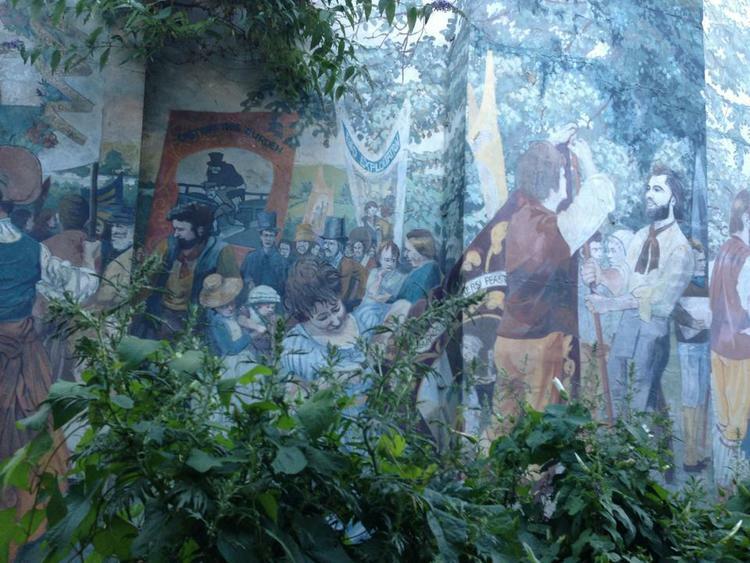 A great example of is the Highbury Grove Mural. Painted in 1986-7, it was sadly destroyed last September, after a “blunder” at the Town Hall. Stretching the height of a several-story terrace house, it celebrated the biodiversity of the local area with paintings of plants and animals which lived around it. There was even a numbered key next to the mural, identifying the species included. South of the river — and still in existence, albeit heavily faded — the Tapestry of Life mural near Clapham Junction is based on the hothouses at Kew Gardens. 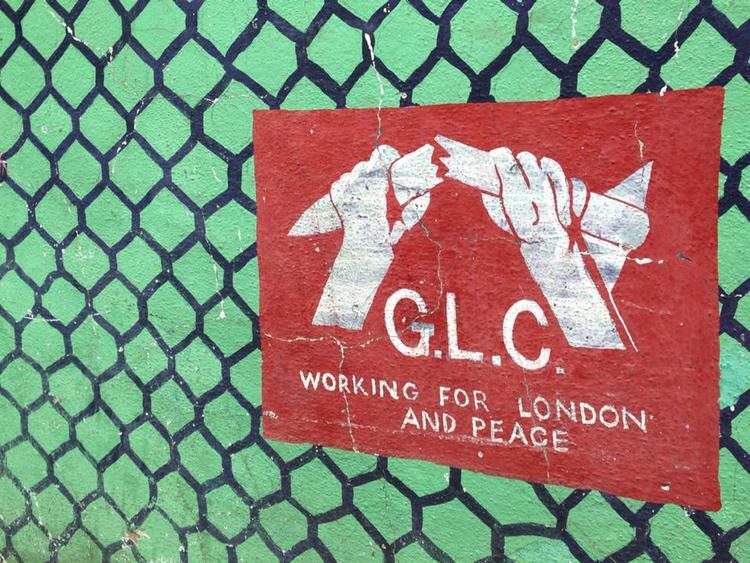 Opened by David Bellamy in 1983, it was the first mural to be funded by the Greater London Council (GLC). I love the little girl peeking out at the side. Tapestry of Life Mural, near Clapham Junction. Detail, Tapestry of Life. Can you spot the Peacock? 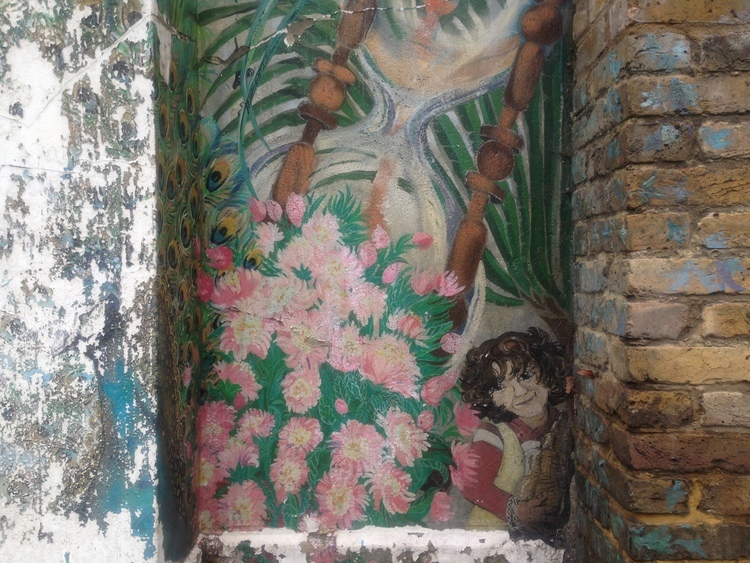 Hoxton’s City Garden mural was painted by local schoolchildren in 1981. Rows of corn, cabbages and beetroot are tended by the shadow of an agricultural worker (though it’s so faded, he or she is little more than a ghost). It looks like beds of roses at the base too, but it is hard to see because it’s covered in graffiti. The piece is a mix of paint and mosaic, with gleaming pieces of mirrored glass picking out particular crops. If you want to visit, it’s just up from the Geffrye Museum, and makes an interesting contrast to the more modern street art the area just South of there is so well known for now. 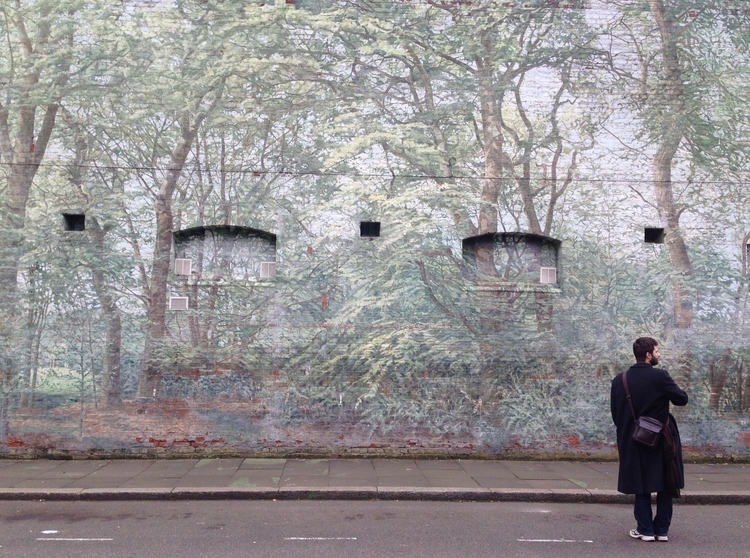 A couple of murals in Brixton demonstrate public enthusiasm for painting nature on the side of their buildings. 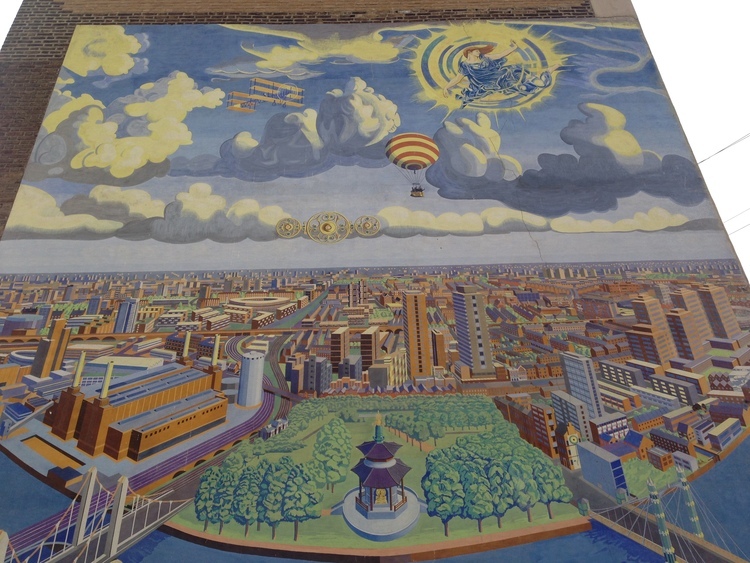 When the Bellefields Road mural was designed in 1987, the London Wall Mural Group sent out questionnaires to local residents, asking about what they wanted to see. The answer was birds, flowers and something non-political. 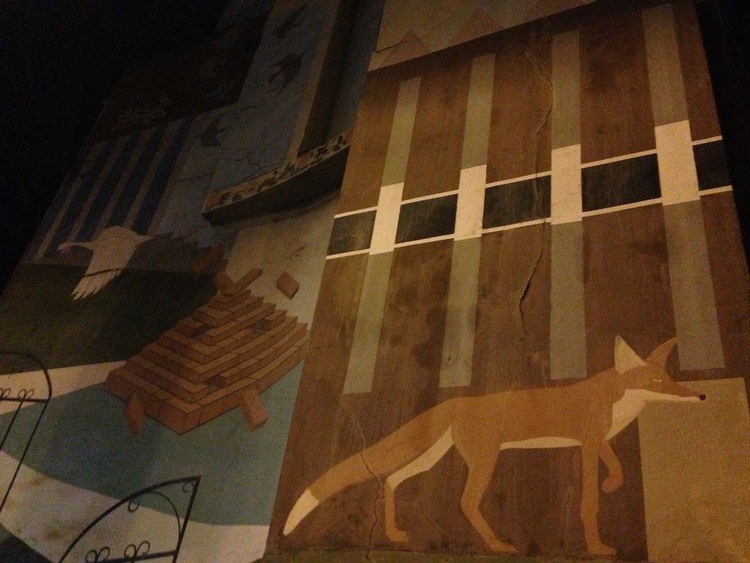 At night, you can spot live foxes scurrying along under the painted one. The Mauleverer Road mural — on side of the stables of an old lager factory — was developed in 1983, when a local residents group wanted to cover up a wall of graffiti. The mural starts with woodland, based on photographs of the New Forest, which lead onto a walled garden based on the local Brockwell Park. There is also a large image of the Caribbean, reflecting geographical links of the area, and horses, reflecting the previous use of the building. It was varnished, which is maybe why it is in such good condition, but it’s also threatened with at least partial demolition due to redevelopment, so visit it before it goes. 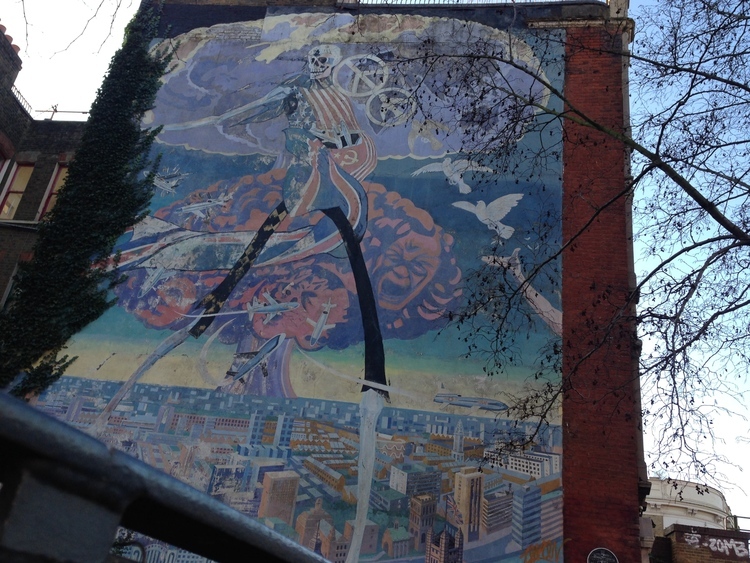 Another strong theme of the 1980s London murals is anti-war, with a particular focus on nuclear proliferation. This reflects the politics of the time, especially the rather left-leaning pro-CND stance of those involved in commissioning or producing the murals. In the early 1980s, six murals were commissioned from a ‘London Muralists for Peace’ group. One of the most striking of these is Nuclear Dawn, painted by Brian Barnes in 1981. Stretching twenty-five square metres in size, a giant skeletal figure, swathed in the flags of nuclear states, stands astride the city as a nuclear bomb goes off behind and more pour from his hands. Just opposite an entrance to the newly developed Brixton Village, it can be quite alarming to stumble across as you wander out of the local pubs at closing time. It’s another one likely to be demolished soon and worth a visit before it goes. Nuclear Dawn’s sister mural, Riders of the Apocalypse, is harder to find, but no less an unsettling sight. On the side of the Sanford Housing Co-operative in New Cross, it’s also by Brian Barnes, but a couple of years later, in 1983. Slightly shorter, but still the height of the side of a house, it shows Minister Margaret Thatcher, Yuri Andropov, Ronald Reagan and Michael Heseltine riding cruise missiles, Strangelove style. Both Thatcher and Reagan are showing rather a lot of thigh. You can also spot references to the economics of the military industrial complex, CND, ecology, and the role of feminism in the peace movement. At the base of the mural are a set of portraits — I’d love to know who they all are — and a nod to explicitly socialist stance of the aspects of the GLC which supported it. Detail of Riders of the Apocalypse, New Cross. Detail at base of Riders of the Apocalypse, New Cross. 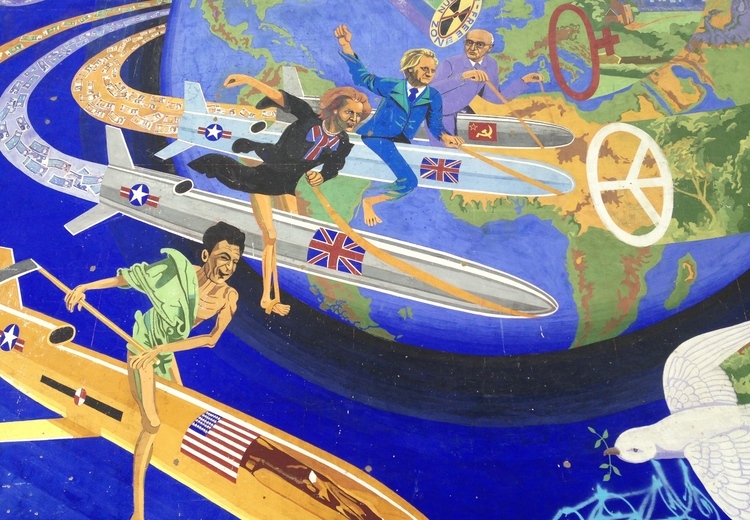 A less obviously anti-nuclear peace mural can be found in Dalston Junction, just next to the CLR James library, with the Hackney Peace Carnival mural. Painted in 1985, it was restored in 2014, so is in excellent condition. At first glance it just looks like a joyous street party, but the political message is there, with banners proclaiming jobs not bombs, no more Hiroshimas and nuclear fee zone. You can also spot references to several unions, Greenpeace and local community arts space, Chats Palace. Detail of Hackney Peace Carnival, spot the “Jobs Not Bombs” banner. 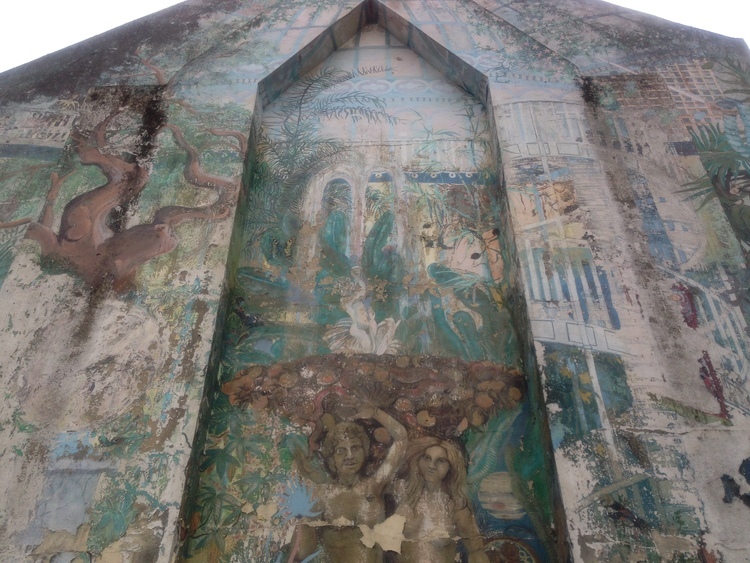 There’s also a way in which murals are used to stress a sense of peace in the community. In North London, the Broadwater Farm Peace mural was commissioned in 1987, after riots. One shows Gandhi, John Lennon and Bob Marley in a park with children playing and a mountain in the distance, with Martin Luther King at the summit of the mountain, deep in thought. A sister mural, from 1991, also offers a calming waterfall. This took seven and half months and two dozen brushes. Due to the wall being pebble dash, the artists had to beat the paint into the walls with the brushes. 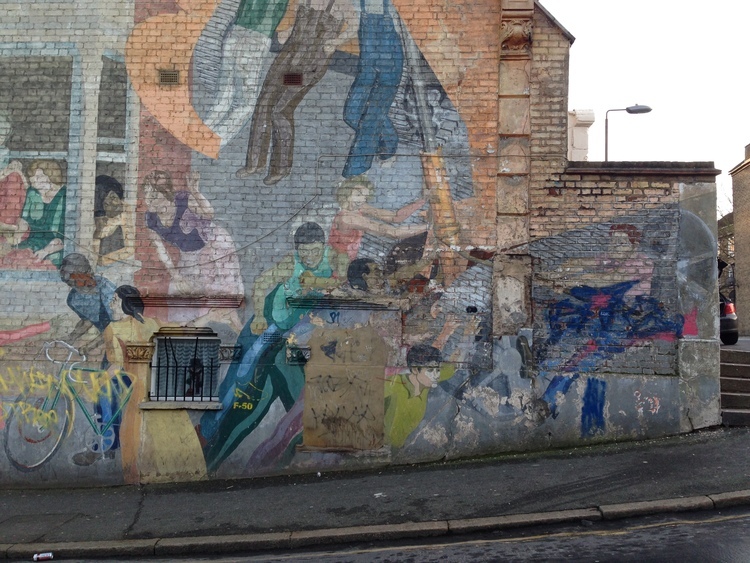 Brixton also has an example of a post-riot mural. Children At Play — high up, above the road, by the Brixton Academy — was painted in 1982. The initial idea had been to depict the struggle of local community, but apparently, following the Brixton Riots, that was seen as a negative reminder for the area, so an imagine depicting radical harmony was picked instead. It’s a stone’s throw from the Police Station, and I’d like to know which parts of the local community, exactly, got a role in making that decision. Something about the overtly propagandist nature of this makes me uncomfortable. There’s something about the Broadwater ones that just feels patronising. There is a lot to be said for the community art projects reflected in these murals, and the ways they allowed people to work together, but the independent street-artists we are more familiar with today are possibly freer to offer a strong critique of the state. 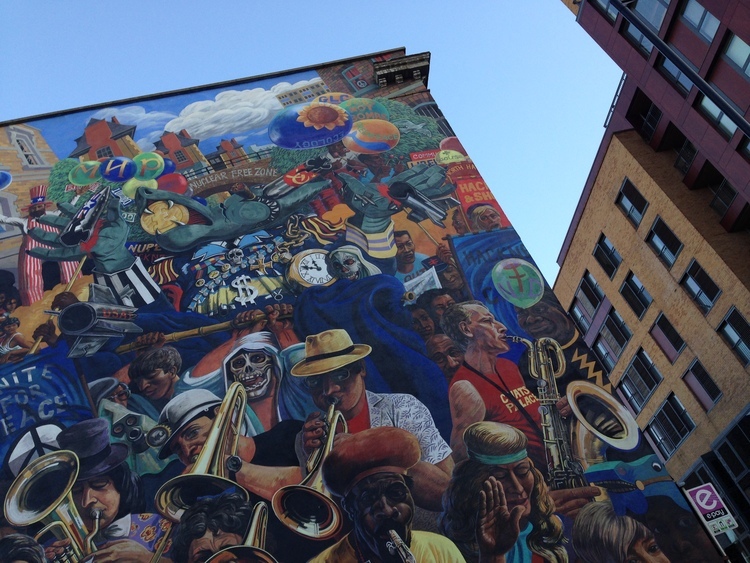 That said, another striking theme in the 1980s murals is an attempt to depict a deliberately provocative “people’s history” of the area, stressing the role of protest, anti-racism and socialism. As with the peace murals, they are, at least, an example of left-leaning local political groups wresting for a voice against more right wing tendencies at both national and local level. 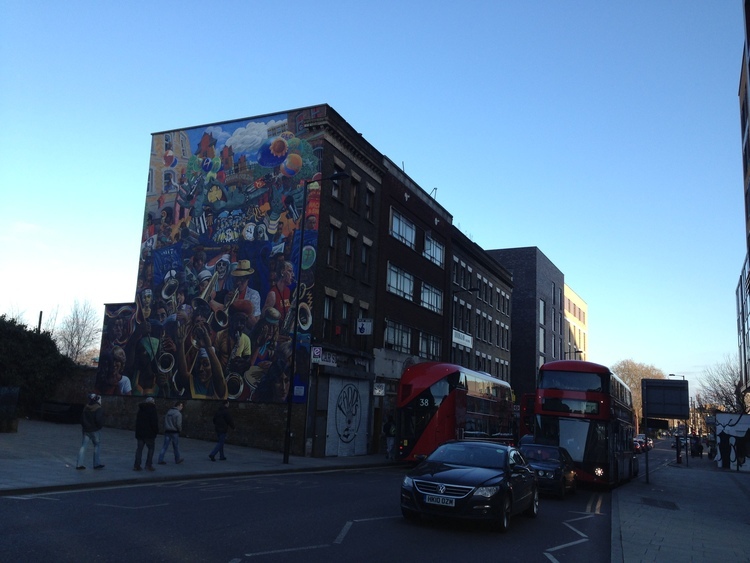 The most famous of these murals is probably the one on Cable Street, depicting the 1936 ‘battle’ of local residents against a group of fascists who choose to march through the area (and, to no small degree, the police). The idea was first floated in the mid 1970s, but not completed in March 1983, with actions of far-right groups a big part of the problem. Even after it was opened, it’s been vandalised several times. In June 1993 when it was attacked with paint bombs, then the artist restoring it had to contend with intimidation from far-right activists who poured paint on his car and slashed its tyres. Look out for a chamber pot being emptied onto fascists, and marbles being thrown under the hooves of police horses. 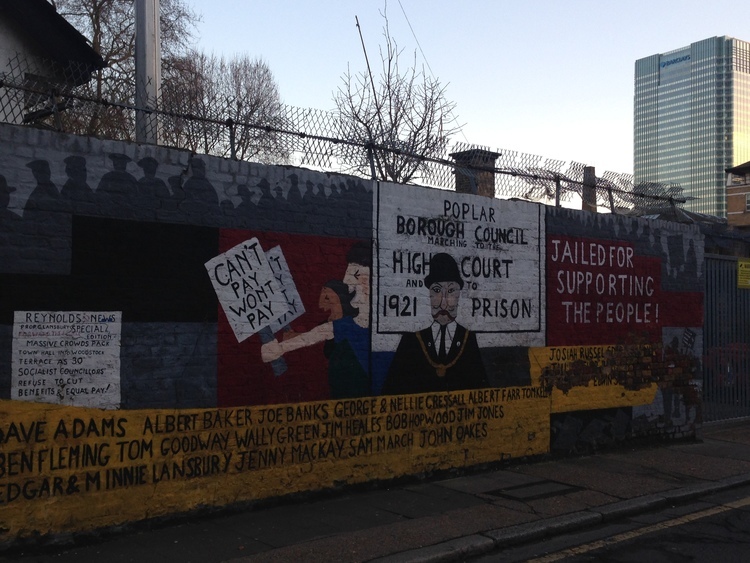 The Poplar Rates Rebellion mural was painted in 1990, with more than a nod to the Poll Tax of the time, and commemorates a protest of 1921. Thirty local councillors — including George Lansbury, Angela Lansbury’s grandfather — refused to collect taxes from residents who were living in extreme poverty. They knew they might risk being sent to prison, and were. Undeterred, Lansbury would address crowds through the bars (he’d previously been imprisoned for inciting suffragettes, it wasn’t an entirely new experience for him). Someone should make a movie of that story, not just a mural. More centrally located, the Tolpuddle Martyrs Mural in Islington was painted in 1984 to commemorate a local gathering of people to protest against the deportation of 19th century Dorset trade unionists. The mural was temporarily covered up by advertising in the 1990s, but local residents campaigned to have them removed, and a 2008 addition to the mural reflects the role of a local activist in this fight. Back in South London, Battersea in Perspective offers an ariel view of the local area, but also some social “perspective” of sorts by way of some local history. A series of portraits at the bast of the mural include John Archer, Britain’s first elected politician of African descent, Shapurji Saklatvala, a Mumbai-born Communist MP for Battersea North in 1922 who was jailed for two months in 1926 for making a speech supporting striking miners, Alf Dubs, who arrived in Britain on the Kindertransport and went on to be a local MP, and suffragette, anti-vivisection advocate and Sinn Féin activist, Charlotte Despard. This was 1988, when references to Sinn Féin and miners would be especially resonant. Using special German mural paint, it is in excellent condition today, but social make up of the area has changed radically since it was painted. I wonder what sort of perspective similar artists would put Battersea in today. 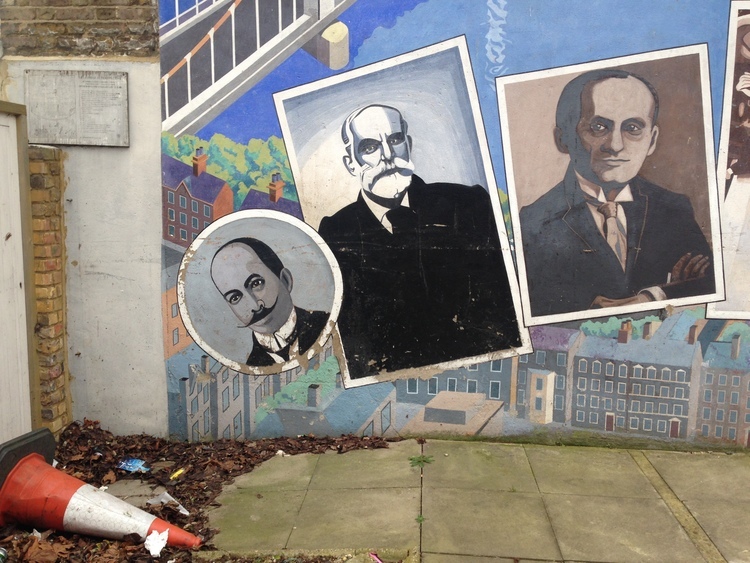 Some of the portraits at the base of the Battersea in Perspective mural. Not all the memorials to local histories are centred on political events. Love Over Gold, painted in 1989, in Depford is named after a Dire Straits song, because several members of the band grew up in the area (apparently Mark Knopfler was inspired by graffiti on a wall near the Crossfeilds Estate). The artist, Gary Drostle, worked with kids at the local primary school, using their pictures as the basis of the mural. He asked them to consider issues of wealth distribution and the environment, and disability is a strong theme, reflecting an organisation training disabled people which used to be in the area. There’s even some braille in the mural, though it’s two-dimensional, sadly it’s not really tactile art (though, as with most murals, you can touch it if you want). To cheat a bit, and end with one of the murals of the 1970s that laid the ground (or rather, wall) for this wave of public art, the Floyd Road mural is a real classic. It depicts local people working together to stop their housing being destroyed. The mural uses the side of the house it’s painted on as an explicit frame, with windows and the shape of the roof offering the angular arms of the diggers the people are fighting. Floyd Road is a nice example of the community activity that many of these murals reflected. Detail of Floyd Rod mural. This entry was posted in art on December 29, 2014 by alice. As NBC reports, “torture teachers” for the CIA earned $80million, and applied the expertise of academically trained psychologists. This got me digging out my notes on the 1970s radical science movement (full feature on this for Mosaic early next year). One of the reasons I’m interested in them is the work they did unpicking technologies of control in Northern Ireland. It’s a story in itself, but one with a fair bit of relevance today: rubber bullets, CS spray, water-cannon, and interrogation techniques. The bulk of the work on so-called “in depth” interrogation was done by Tim Shallice, who later went on to be director of the Institute of Cognitive Neuroscience at UCL, and a Fellow of the Royal Society. Although it wasn’t directly Tim’s area of expertise, he knew enough of the relevant science to help translate it for a broader audience, and bring the topic under greater scrutiny. He had some professional distance from the subject, so could be a lot more critical/ take a lot more risks than many others working more closely in the field, whilst still having some specialist knowledge. Some scientists might be happy to weaponise their scholarship, but people like Tim could disrupt that. Here’s an extract from a 1974 pamphlet The New Technology of Repression: Lessons from Ireland, co-authored by Tim, which explores the issue of interrogation. Of the 342 internees arrested on the rely morning of August 9th, 12 were subject to much more complex procedures than the others. After being held for two days at Regional Holding Centres, they were transferred to an “interrogation centre” (location unknown) for ten hours, transferred again to Crumlin Road Jail, and returned to the interrogation centre. (All movements were performed hooded.) The men were held at the centre for ix days. Except when actually being interrogated they were kept in a room — the ‘black hole’, as one of the interrogators called it. When it the black hole, they were forced to stay in a fixed position with their hands spreadeagled high on the all and their legs apart. (The KGB called this the ‘stoika’ position.) If they collapsed, or moved to try to relive the numbness in their limbs, they’d be beaten back to position. the room was filed with a loud monotonous sound “like the escaping of compressed air” or “the constant whirring of a helicopter blade”. Their heads were reseed in loosely fitting boiler suits. No sleep was allowed or the first two or three days, and their diet was restricted to bread and water. The temperature was normally too hot, occasionally too cold. The components of this process — disorienting and impersonal post-arrest procedures, sleep deprivation, inadequate food and isolation — are the classic components of personality break-down processes long used by interrogators. The best documented use of these methods was that by the KGB in the Soviet purges of the 1930s. The British methods of 1971 we’re hover more severe than those of the KGB. In particular, the KGB achieved isolation by placing the prisoner in a featureless, relatively silent room, and making him continually face the same way. In Northern Ireland, isolation was achieved by the prevention of ay chafe in sensory input by use of the hood the mashing noise (white noise of 85-87 decibels), the fixed position and the wearing of a loose-fitting boiler suit — an altogether more extreme regime. Even in the reassuring atmosphere of a psychological experiment, her subjects are amply rewarded for staying in a comfortable sensory deprivation environment, the situation is a very stressful one. Hallucinations, nightmares, inability to think, fears of madness, body-image distortions (e.g. “my body is like a spinning cone going away from my body”) and paranoid delusions occur frequently. In situations where subjects are also printed from moving, hardly anyone can stand it for more than 10 hours. In Ireland even the official Compton Report admits to durations “at the wall” of up to 16 hours at a stretch, and of up to 43 hours if breaks for interrogation are ignored. I’m not sure where the equivalent scientists like Tim are today, or if a 21st century academic career allows the same time and freedom he enjoyed. Britain ended up in the European Court of Human Rights on this issue, in case you were wondering. I don’t know if any of it offered useful information for the interrogators. This entry was posted in campaigning on December 10, 2014 by alice.